Through the good and the bad, Luke Walton has become inclined to allow rookie forward Brandon Ingram to play through his mistakes. 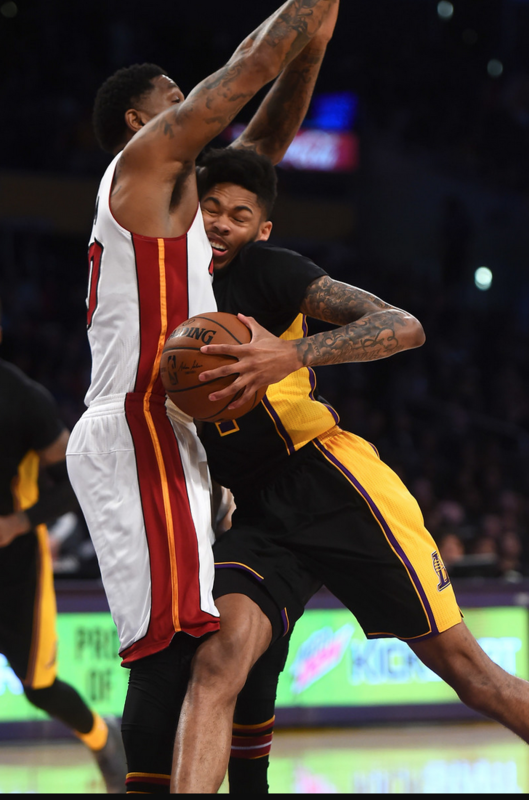 Generally speaking, Walton believes that approach will allow Ingram to accelerate his development. Walton also has wanted to reward Ingram with playing time for his steady progression and consistent effort. But after Ingram appeared overwhelmed as the Lakers’ starting point guard in the team’s loss to Dallas on Sunday in what became the most lopsided defeat in franchise history, Walton sounded uncertain if Ingram would receive that nod when the Lakers (16-32) visit the Portland Trail Blazers (19-27) on Wednesday at Moda Center. Ingram had six points on 2-of-12 shooting in 36 minutes against Dallas, a sharp contrast to the 15-point performances he posted last week in consecutive games against Detroit and Indiana. Lakers guard D’Angelo Russell will travel with the team for its back-to-back in Portland (Wednesday) and Utah (Thursday) to continue his rehab on mild MCL sprain in his right knee and strained right calf. That leaves Walton possibly leaning on 35-year-old veteran reserve Jose Calderon, who has averaged 3.8 points on 45.1 percent shooting and 2.2 assists in 12.3 minutes through 21 appearances. That would put Ingram back at the small forward spot. But it doe not appear likely he would start there. Though Lakers veteran forward Luol Deng left practice early on Tuesday after colliding with Tarik Black, the Lakers expect Deng to play. Deng, who has nursed a sprained right wrist in recent days, has not missed a start unrelated to injuries despite averaging 8.2 points on 39.6 percent shooting. Lakers podcast: Is D’Angelo Russell making enough progress? Follow L.A. Daily News Lakers beat writer Mark Medina on Twitter and on Facebook. E-mail him at mmedina@scng.com. Subscribe to the “We Want Tacos” Lakers podcast on iTunes.